Orange Cauliflower – Roasted cauliflower in a sticky sweet orange sauce that’s loaded with diced peppers. Ready in less than 30 minutes! I’m dubbing myself the queen of cauliflower. I love the stuff so much. And you guys seem to love it too, making my Crispy Baked Cauliflower Tacos and my Buffalo Cauliflower Bites two of the most popular recipes on the blog. 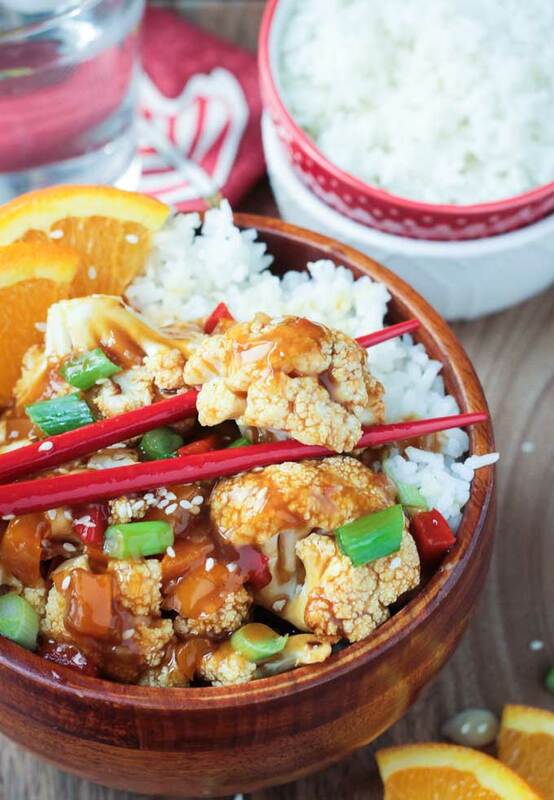 I’m back today with another quick and easy recipe featuring this versatile veggie – Orange Cauliflower! The cauliflower is roasted until just tender and then smothered in a sticky sweet fresh orange sauce. Serve it over rice for a healthy meal more delicious than take-out place down the street. 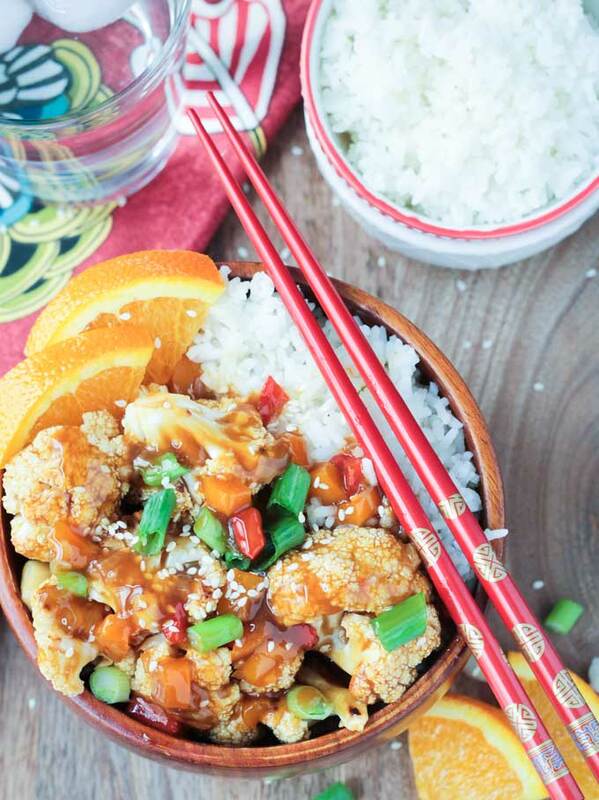 This recipe is a play off of Orange Chicken, which you’ve probably seen before. Traditionally, the chicken is battered and fried before being added to the sauce. Obviously, we are using cauliflower here in place of the chicken. You also won’t find any batter to be fried in this recipe. Sure, I could have battered it and then baked it for a healthier version, but personally, I just don’t think that’s necessary. Instead I roasted the cauliflower until just tender, with still a bit of a crunch. Then finished it off in this sweet and sticky fresh orange sauce. Not only is the cauliflower super healthy, but the orange sauce is loaded with bell peppers and fresh squeezed orange juice, which means even more vitamins coming your way. I have no idea what’s in the orange chicken at your local take-out joint, but I can pretty much guarantee it’s got nothing on the nutrient profile of my Orange Cauliflower! 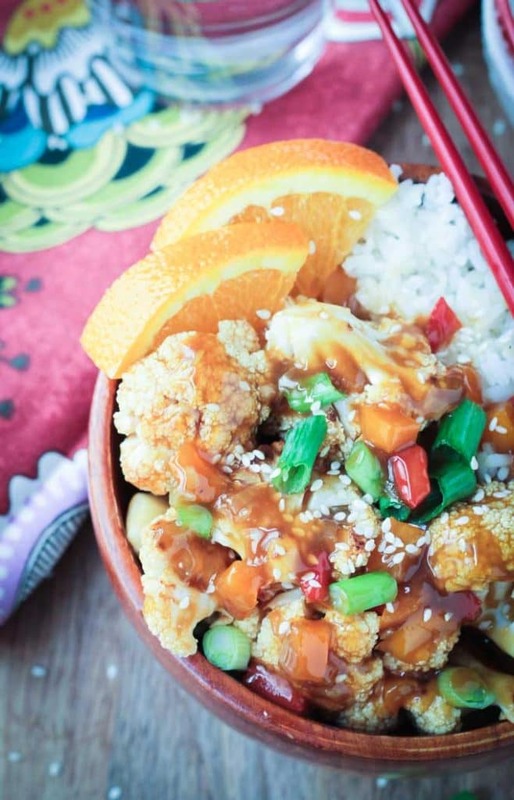 Add this Orange Cauliflower to your list of recipes to try. When you do try it, please come back and leave me feedback below with your star rating, letting me know how much you loved it. You can also find me on social media. Be sure to tag @veggie_inspired and #veggieinspired so I’m sure to see your posts. 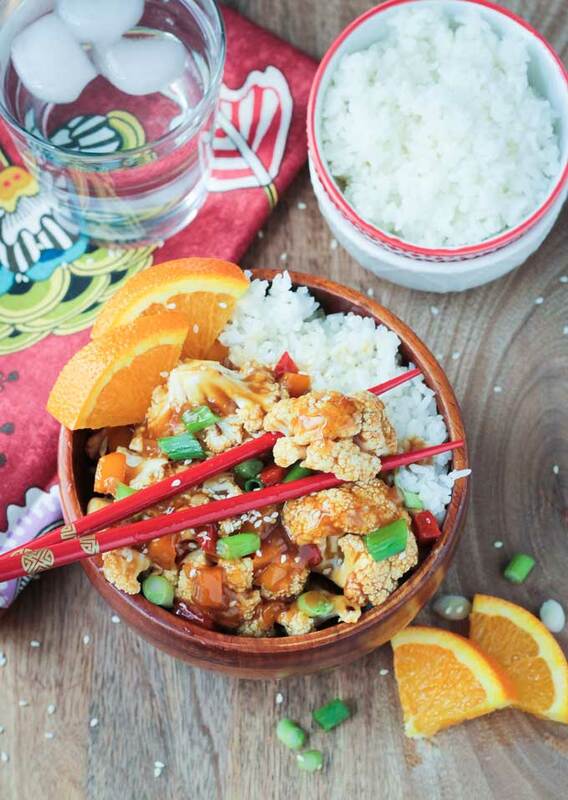 This Orange Cauliflower is a veganized version of your favorite orange chicken recipe. The cauliflower is roasted and then tossed in a sticky sweet orange sauce that's loaded with sweet diced bell peppers. Perfect alone or served over rice. Cut the cauliflower into large bite size florets. In a medium bowl toss the cauliflower with 1 tbsp juice. Place the cauliflower in one even layer on a rimmed baking sheet and bake for 15 minutes, (Add an additional 5 minutes if desired, but I like mine to still have a crunch). Cauliflower should be just browning on the edges. While the cauliflower is roasting, whisk together the orange juice, soy sauce, maple syrup, and vinegar. Set aside. Stir together the cornstarch and water until smooth and set aside. Add 1/4 cup vegetable broth to a large pan over medium heat. Add the onion and garlic and sauté 5-6 minutes until soft. Add another 2 tbsp vegetable broth to the pan and add the peppers. Saute 5-6 minutes until softened. When the peppers are softened, add the orange sauce to the pan and turn up the heat to bring to a boil. Once boiling, add the cornstarch/water mixture and stir well to incorporate. Simmer over medium heat until the sauce reduces and thickens to almost a syrup like consistency. Add the cauliflower to the sauce when it's done roasting and stir to coat well. 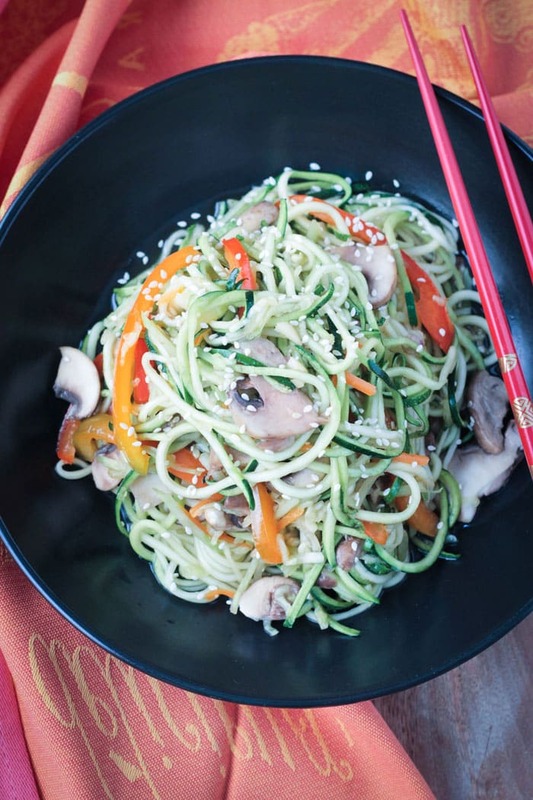 Sprinkle sesame seeds over the top, if using, and serve immediately by itself or over rice. ~Fresh squeezed juice will give the best flavor in this recipe. Store bought juice will work in a pinch, but know that the orange flavor won't be as vibrant. ~Nutrition facts calculated without sesame seed garnish or rice for serving. Thank you, Jane! So happy to hear it was a success all around. It’s one of my favorites too! 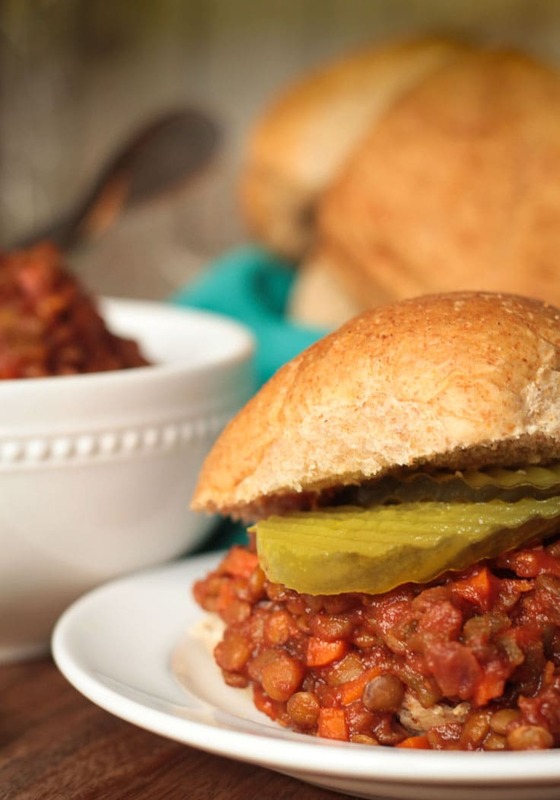 Hi Jenn, this recipe looks amazing! Unfortunately in my country is very hard to find maple syrup, what can I use instead of it? Thanks! Hi, Dorothea. You could use agave or even just brown sugar. If you use brown sugar, start with just two tablespoons as it tends to be sweeter, and you may need to add a little bit of water to thin it out. Let me know how it turns out! I’ve never made this kind of orange sauce before but I know I would love this! It looks so full of flavour. You should definitely try it, Becca! So good! Thank you! My hubby is a big fan of cauliflower so I am always looking for new ideas for cooking cauliflower.This is very innovative. Thank you, Nayna! I hope you both enjoy! Thank you, Sina! The sauce is so good! 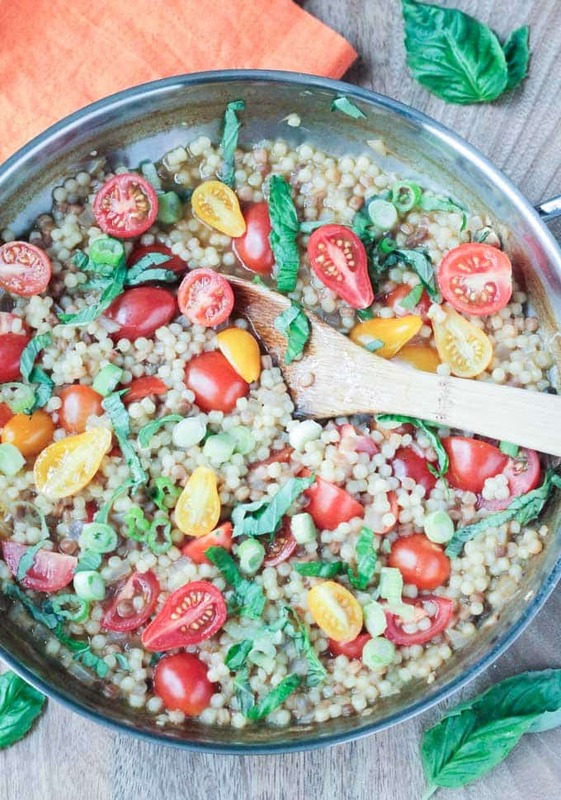 Ok Jenn this looks like such an incredibly gorgeous meal – it looks SO flavorful! Thank you, Ceara! It’s definitely going to become a staple around here! We used to love orange chicken! This looks delicious. My hubby has actually asked me to recreate his favorite part orange chicken dish, but it was a bit different than this. I have it on my long list of todo’s! Thanks, Sophia! I have a long list like that too. Never enough time!! Seriously, whenever I need cauliflower inspiration, I’m just going to visit your blog Jenn. And this looks waaay better than takeout! Pinning–this is my kind of meal!! LOVE!! Ok I am making this tomorrow night!! I also think of myself as the cauliflower queen 🙂 but I haven’t tried it in a dish like this, and I am very excited to! Oh yay – we can rule together! 🙂 I hope you love it! Please let me know how it turns out!! Enjoy! Always homemade food is good. But I will find an excuse to eat out side for non Indian cuisine. This time no excuse I will try this 🙂 looks very good Jenn. Thank you, Uma! If you get a chance to try it, please let me know what you think! Love this as a healthier option. So much better for you, and quite honestly, looks like it tastes better! OMG that looks amazing!! I love orange sauce and I guarantee you I’d be sneaking spoonfuls of this into my gluttonous mouth before it made it to the delicious bowls of cauliflower. HaHa, thanks, Linda!Sneaking spoonfuls is perfectly acceptable in my book!Thank you! Queen Cauliflower…that made me laugh! The humble cauliflower is such a wonderful ingredient and this recipe looks delicious. I love citrus flavours in savoury recipes. I think I’ll make myself a sash. 🙂 Thanks, Mel! I know citrus is a winter fruit, but it’s so fresh and vibrant that it really reminds me of spring! Ugh. YES! When I see orange on a menu….it must be had! One of the best “chinese take out” flavors! Mouth is watering here. Big time! I agree, breading not necessary at all when you have that thick delicious sauce to douse it in. One of my all time favorites, and I am pretty amazed it’s oil free! One of my favorite take out splurges is orange “chicken” from the vegan Chinese place here in town. Maybe I can kick the habit with this recipe! You have a vegan Chinese restaurant??? That is awesome!! I’m super jealous, but yes, this should do if you are up for making it yourself! And super quick too! Thanks, Becky!